For most people hearing an alarm at midnight is not something to be excited about, but for us the excitement was just beginning to build. We were camped at Willow Slough Fish and Wildlife Area in northwestern Indiana. As we pulled ourselves out of our warm and comfortable sleeping bags to start our day, we were serenaded by Whip-poor-will’s and Barred Owls. Some people may not have understood our excitement about our first two birds of the day but that is because they do not understand what a Big Day encompasses. The goal of a Big Day is to see as many species of birds as you can in a 24-hour period. So the first bird is always reason to celebrate. 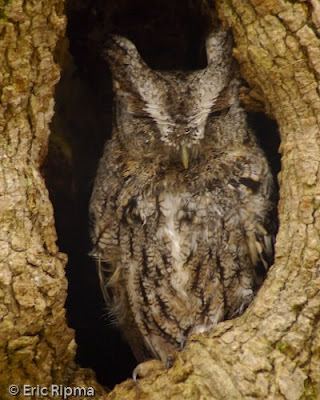 After quickly packing up our tent we were on our way to the southern section of Willow Slough FWA to pick up Eastern Screech-Owl. It didn’t take long and we quickly headed up to a marshy area in the northern section of Willow Slough. While hiking out into the marsh we heard many species, including one of my favorite night singers, a Marsh Wren. These small birds sing throughout the night, never seeming to sleep. We were still missing one owl, the Great Horned but with a little bit of driving around, we soon located an area where four of these Owls were hooting back and forth. We had picked up all of our target birds very quickly, but we still needed to get a few more birds that would elude us if we were forced to search for them later in the day. At this point we headed to Kankakee Sands, a big marsh about ten minutes away, to try for American Bittern and American Woodcock. We quickly heard both and were on our way to the shores of Lake Michigan. The time spent in a Big Day before it gets light out is a special time. Many birders never experience nature in the middle of the night. It is a much different place at night, with many different sights and sounds. The time before it is light is the most relaxed time on a Big Day. You are not forced to race around and search every tree for birds. Seeing many birds in a relatively short time is the whole point of a Big Day and this occurs at daybreak, but the time before this is spent not worrying about how many birds you have seen. Instead you enjoy every bird and the way that wildlife lives at night. When we got to the lakefront the sky was just beginning to lighten, we heightened our senses as we listened for any sounds as we drove along Beverly Shores. We headed to our first stop on the lake, Michigan City Harbor, to try for some gulls, terns, and waterfowl. We quickly picked up the common gulls and terns. There was a small feeding frenzy in the harbor and we were able to pick out one Bonaparte’s Gull and one Lesser Black-backed Gull. Both of these birds were big bonuses for our day that we did not expect. Our only miss here was the local Peregrine Falcon, this bird always perches on a smokestack that is visible from this site, unfortunately for us we have never seen it on a Big Day, but have never missed it any other time. The sun had risen and we needed to start finding all of the beautiful songbirds that migrate through Indiana every spring. We headed to an area about ten minutes away called Beverly Shores. This area is residential but much of it is marsh that cannot be built on, creating a great stopping point for migrants before continuing over Lake Michigan. Very quickly we had added many warblers including Golden-winged and Cerulean. With some luck we were able to spot our only Sandhill Crane and Hooded Merganser of the day. The day before my brother, Rob, and I had found a large flock of migrants across the road from Beverly Shores. When we headed that way we were expecting lots of birds and we weren’t disappointed. We located a large flock containing many warblers including our only Hooded Warbler of the day. It is about this time in a Big Day that you realize how tired you really are. New birds are hard to come by at this point in the day, and you start to realize some of the birds that you have missed and still need to see. It is at this point that you wonder why you ever even planned to try a Big Day; you miss the times that you could stand in one spot and just watch the birds. As soon as you reach the next location though you realize you don’t have time to think about this because in a Big Day the birds that you have not seen are much more important than the ones that you have already seen.